First I want to talk about pre-conceptions, or as the Dutch would say, voorordelen – pre-judgements. Something that fascinates me about people in general, is the multi-facetedness of individuals, and the communities we create. Because there are communities inside communities, micro-cultures to which we either gravitate to or are repelled from. Its part of how we find our places, how we feel belonging, and how we reciprocate with others. It seems to be a natural order within most modern societies and an important part of how we structure our understanding of the world and the people around us. I also find it fascinating to apply these thoughts to the fiber community. I see that there are many levels to this. Firstly the overall, global population of spinners and fiber artists, all the people who spin and create with fiber. We all have this in common and can identify ourselves as being part of this community Inside this global community, there are many sub-communities, each with their own culture, beliefs (about fiber) and what they consider to be, to put it simply, right and wrong. I can make some basic divisions here. A straightforward one is traditional spinners, and ‘art’ spinners. And this is where I come to my observations about preconceptions. Something I have noticed during workshops and spinners gatherings, listening to discussions and opinions, joining in the facebook groups, is that these two communities have quite a few preconceived ideas about each other. I prefer not to generalise, however some assumptions can be made when hearing or seeing the same ideas and opinions expressed regularly, so this is what I am doing, generalising based on things that seem to commonly take place within the fiber world. Why am I thinking about this? Well one of the overriding reasons is that I am looking at directions for myself in spinning. I am looking at what people are doing, what has been done, what people are enjoying. I notice stuff 🙂 I have noticed that within this culture of ‘traditional’ spinners, there is a sub-culture who tend to look upon ‘art yarn’ spinning as something of a low-skill activity, as only big bulky ‘beginner yarns’ or simply thrown together fibers that are far too random and chaotic to be considered either good or well spun. I am sure that in some cases this may be the case. But from my own experience, I can say with much conviction that I put a huge amount of thought, planning, and design elements into the yarns I create, which are clearly not ‘traditional’ yarns and fall much more fittingly into the art yarn category. In my search for new things, I have moved a long way into developing my interest in construction, aspiring to become a yarn architect as I attempt to build layers of fiber into yarn and experiment with the interplay of fiber and colour in different combinations. Some of this requires me to make quite traditional kinds of yarns, which I then play around with and ply in non traditional ways, or use non traditional fiber preparations and more traditional techniques to spin. I know other ‘art yarn’ spinners who do create huge yarns, big, bulky, random, heavily textured, and put an equal amount of time and skill into preparing their fibers, planning their yarns, and creating usable, stable, and beautiful skeins of GOOD yarn! Being an art yarn spinner does not mean I don’t or can’t spin a nice fine single or create a perfectly balanced skein, but a triumph for me is to be able to make a balanced skein with a multi-layered and bulky art yarn! I think that needs quite a bit of skill and experience, and was certainly not achievable when I was a raw beginner. Heres another preconception; that people who spin traditional yarns are not open to the idea of variation from that singular goal of ‘fine yarn equals the only good yarn’. I have observed that at times, art yarn spinners have the idea that traditional spinners will have their minds blown by huge stacks, crazy textures, or random combinations of uncarded fibers and that they won’t consider how technical skill can be necessary to construct these yarns. However I have also experienced that many traditional spinners are often very curious about art yarns, interested in how they are spun and willing to give anything a try, or they have already made something like these yarns in the past! I am thinking, with all this, is that the whole thing comes down to a problem of labelling, which tends to put things (and people) into boxes and general categories, the places that actually NONE of us fit well! Why don’t we just SPIN!? I am thinking that any and every yarn that has something of YOU in it, an idea, a feeling, a concept, an image in your mind as you spin, a deliberate choice to express something, those are ALL ‘art’. If you are spinning purely to knit, crochet, create, with no particular goal of self expression through your hands and fiber, its STILL ART! Because you are creating something, that before you started using your hands on it, just totally did not exist! Did you ever stop to think how amazing it is that we can take an empty space in the universe, and place something in it, something that didnt have any form or existence before you created it! If you made it, loved it, delighted in the creation of it, then it is always PERFECT. So my spinning direction for next year, is to…. just spin! I am going to try not to make any prejudgements and to try anything and everything that involves fiber and twist, in every combination I can dream up. I think the key is to be open – we can all learn from each other. Art yarn is built on techniques from traditional spinning. I started out in a regimented course for traditional spinning, but life got in the way, and I dropped out. A chance encounter with a marvellous woman who taught me how to corespin has launched me into a new phase of my life. Art yarn suits where I am right now – I want my inner artist to break out of the chains that bind her, and celebrate life with yarns that are a riotous blend of colours and textures – the Funk Queen rises. At the same time, there is the part of me that knows I will return to the more “technical” side of spinning one day. I think we should celebrate each other, and embrace that it was an innovator who looked at a spindle, and knew there had to be a way to spin that would be more time efficient, and yet still produce beautiful yarns. That same innovator has paved the way for us all, including those brave enough to launch the art yarn movement! Thanks Suzy, it is true ; we do tend to label. Some traditional spinners think art yarns are mad, but some are intrigued. And some have already “done” them and gone back to their first love. We really shouldn’t label. Soon I will be having my first 2 big market stalls with a table full of both traditional and art yarns. I am a little nervous. And intrigued too. How will people react to them? How will they label them? I am taking the plunge! Thank you for sharing such brilliance! The notion of “labels” often provides safety for some. I want to comment on your ideas about community. After our basic needs are meant, we as humans seek to have three ther needs met…fun, significance and belonging. We all want to enjoy ourselves, we all want to feel like we are contributing and making a difference, and we all want to feel valued. I do think for me the fiber community provided all of this for me. I also do think that there are gaps to bridge and your notion of preconceptions really does describe what I have personally experienced. Thank you for opening this conversation. I do look forward to the discussion. Also, I call myself a flexible spinner. Fiber talks to me, and then I decide if something is going to be a traditional yarn or part of something wild and crazy. I do think that the most important element however, is to understand that spinning yarn does not have to be I service of something that will be made later, but is in itself a work of art to be admired. It’s all about self expression, purposeful or otherwise, it is self expression….and it is ALL creation. I really like the term yarn architect. 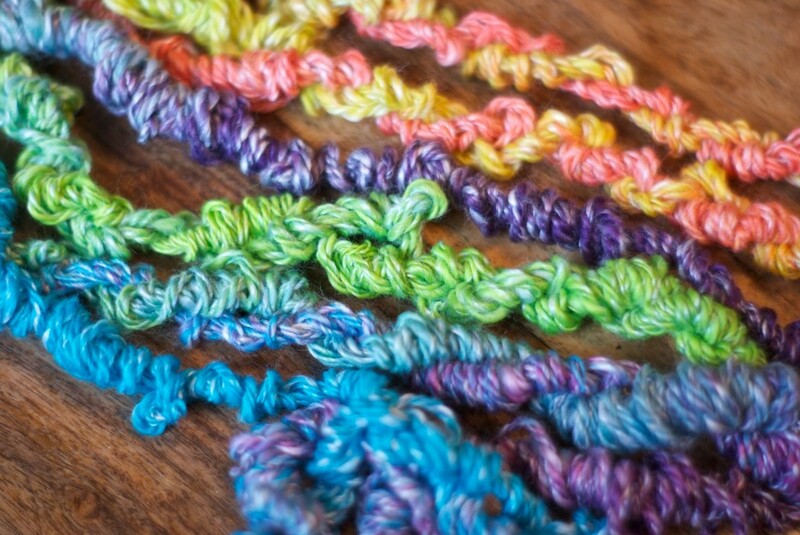 A long while ago, Pluckyfluff (Lexi Boeger) and many others had a long discussion about what terminology to use….people were beginning to find the term “art yarn” annoying. The same way “art quilt” was annoying to some. I am just a novice and I feel the same… I am totally “jealous” of people that can spin a single soooo regular that even a machine cant do better.. And then I love, adore bumps and colors and all the stuff and craziness that can be in an art yarn.. Yes Lise! Just spin 🙂 We worry far too much about what other people might think, and spend far too much time comparing what we do to some magical standard. The more you spin the better you get at it and everything you create is art!